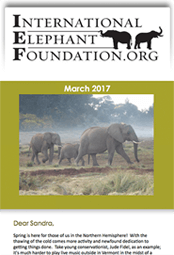 IEF is now accepting proposals for 2020 Elephant Conservation and Research Funding Support! IEF announced their support for 24 conservation projects in 13 countries spanning 3 continents, adding to the over $5.5 million in direct conservation funding since its founding. IEF Newsletters are published and are available for distribution! Do you get a copy? Have you signed up to receive the newsletter? If not, please enter your email address in the box and hit submit. Keep up to date with the IEF events and activities as well as the program updates and reports.